Above: A floral salute in the Deck 2 corridor leading to QM2's Grabd Lobby. Below: Union flags above QM2's Britannia Restaurant. Above: The Royal Pageant on the Thames River was shown on the big screen in QM2's Royal Court Theatre. Below: Just in case - - A plaque in one of the boxes in QM2's Royal Court Theatre. Above: Guests gather with QM2's musicians to sing patriotic and popular songs as part of the celebrations. Below: The buffet for the "Street Party" on QM2. Above: The Jubilee Cake in Queen Victoria's Grand Lobby. Royal correspondents - - Nicholas Owen on QM2 (below) and Brian Hoey on QV (right). On 5 June 2012, all three of Cunard Line’s ships - - Queen Mary 2, Queen Victoria and Queen Elizabeth - - met in their homeport of Southampton, England to celebrate the Diamond Jubilee of Her Majesty Queen Elizabeth II. While not the largest passenger ship line in the world, Cunard is one of the oldest (170 years) and still maintains a worldwide reputation for elegance and glamour. All of its ships do not come together very often. (See articles on some previous gatherings New York 2011, New York 2008). Thus, a gathering of all three Cunard Queens is indeed a tribute. The Diamond Jubilee marks Queen Elizabeth’s 60 years on the throne. The significance of the Diamond Jubilee to the British people would be difficult to overstate. “It’s about loyalty to the Crown and being British,” explained Captain Christopher Wells, who commanded Queen Mary 2 during the evening Jubilee events. The Queen is the living symbol of the nation and thus the focal point for patriotism. Unlike most heads of state, she is above the political fray and thus is a symbol for everyone rather than for just one partisan faction. Furthermore, the reign of this monarch has not been uneventful, spanning such turbulent times as the recovery from World War II, the Cold War, the end of the British Empire, Swinging England, the beginning of the Commonwealth, Britain’s entry into Europe, the Falklands War, the change from a manufacturing to a service economy, to name just a few. She has remained a constant throughout all of these changes. Furthermore, there is general agreement that she has handled her role with dignity and professionalism. Thus, in addition to feelings of patriotism, there is widespread admiration and affection for the person. The feeling is apparently mutual. In response to a letter outlining Cunard’s plans for the Jubilee, Buckingham Palace responded: “Her Majesty was pleased to learn about these events and has asked me to say that she would be delighted to receive a photograph of all the Queen ships together.” (see letter). Cunard’s celebration of the Diamond Jubilee was not limited to the events in Southampton on 5 June 2012. Rather, events also took place onboard the ships during the voyages immediately prior to and immediately after the three ships met in Southampton. To illustrate, Queen Mary 2 crossed the Atlantic en route from New York to meet her fleetmates. Each day of the crossing, a story about the Queen and/or the Diamond Jubilee appeared in the Daily Programme. 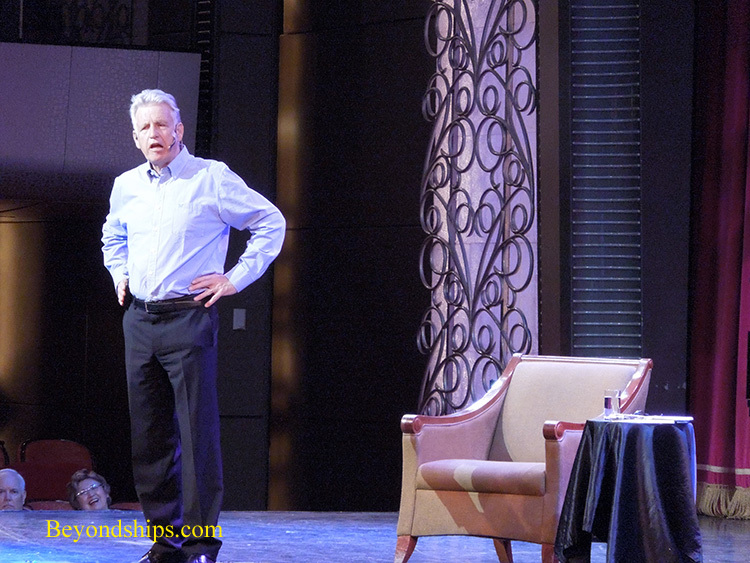 Onboard was broadcaster and former royal correspondent Nicholas Owen who also provided insights into the Royal Family. On 3 June, guests were able to watch the Royal Pageant taking place on the Thames in the Royal Court Theatre and the Golden Lion Pub. This was followed by a “Street Party” - - a festive buffet set up along the corridor on Deck 2 leading to the Britannia Restaurant. The next day guests were able to participate in the singing of patriotic songs in the ship’s Grand Lobby. Later, they were able to watch a broadcast of the Diamond Jubilee Concert in Illuminations, the ship's planetarium and cinema, and in the Golden Lion Pub. Throughout the ship were Union Jacks and floral displays. Along the same lines, Queen Victoria was bound for the Adriatic following the gathering in Southampton. 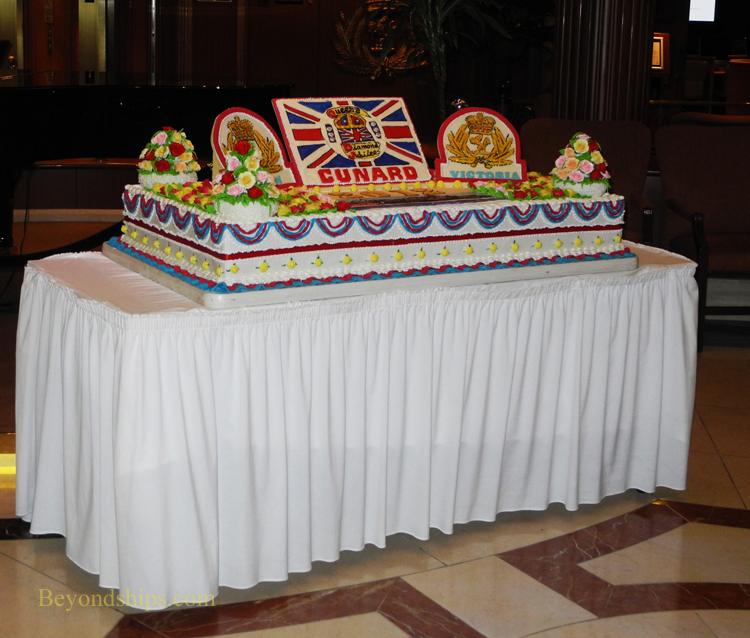 Guests arriving onboard found an elaborate Diamond Jubilee cake in the Grand Lobby. On 6 June, there was a special Diamond Jubilee dinner (see menu) followed by a Diamond Jubilee ball. 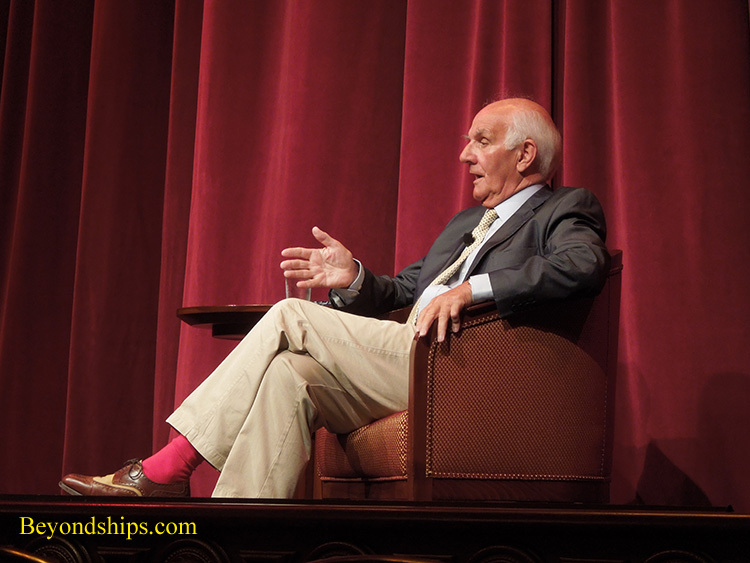 Author and royal correspondent Brian Hooey was aboard throughout the cruise to talk about his experiences with the royals. Click here to go to Part III of this article - - The Evening Celebrations.